Nifty opened flat to weak on negative global cues, and steadily went down to end the day just above the lows at 5691.40 a loss of 25.75 points. 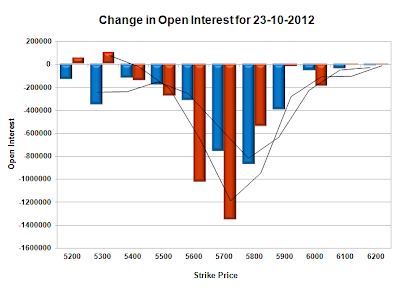 Nifty had a good rollover for the day at around 57 lacs and now OI in November series is just above 1.46 crore. The OI Table saw huge liquidation by both the Bulls and the Bears, with highest liquidation seen around 5700 level with none of the parties seem sure of the level. Call option 5800 and above saw huge profit booking, with huge liquidation seen at 5700 and below strike prices. 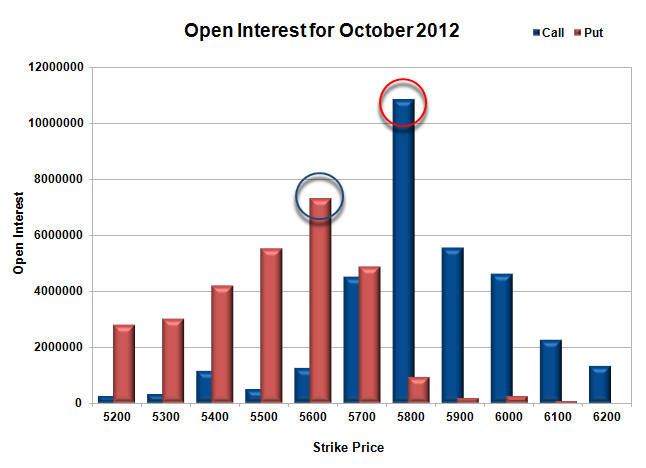 Put Option 5600 and below saw huge profit booking, with huge liquidation seen at 5700 and above strike prices. Highest accumulation on Call option 5800 at 1.09 crore & 5900 at 55.5 lacs whereas Put option 5600 at 73.3 lacs & 5500 at 55.1 lacs. Nifty Open Interest is at 1,39,34,300 down by 57,93,100 whereas Nov series added 63.58 lacs with decrease in price, most probably 100% rollover with some short build-up. Bank Nifty Open Interest is at 8,15,350 down by 2,56,275 whereas Nov series added 2.59 lacs with decrease in price, most probably 100% rollover with small short build-up. FII’s bought small 0.41 lacs of Futures, most probably long build-up, as their Net OI also increased by 8.73 lacs, and their average price per contract comes to around 5142. FII’s future open contract as on date is 718471. 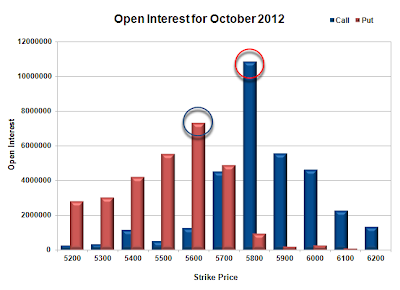 PCR Open Interest (Volume) is at 0.973 still under Bear control. Support at 5600, with huge OI of 73.3 lacs. Huge and only resistance right now at 5800 with highest OI of above 1.09 crore. 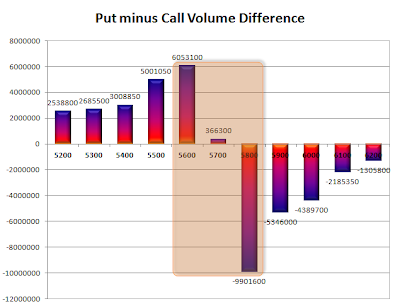 Range as per Option Table is 5649 -5744 and as per VIX is 5651 - 5732 with 5700 as the Pivot.